As the result of a sale of some 5,000 roosters on August 15, a bridge is to be built across the Tombigbee river at Demopolis, Alabama. Thus another obstacle on the Dixie Overland highway is to be removed. The bridge is to cost about $175,000. The rooster sale netted about $250,000 [approximately $50 each]. The additional funds will be utilized to improve the road and the approaches to the bridge in Marengo and Sumter counties. The work will be carried on under the direction of the State Highway Department of Alabama. An accompanying photo shows "the Alabama Good Roads-Rooster Party" during a visit with President Wilson at the White House. The caption notes that President Wilson can be easily picked out, but for those who may not be able to pick him out easily, he's standing on Rear Admiral Benson's right. 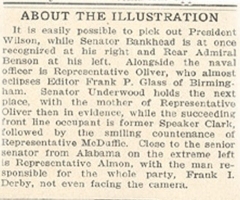 The caption adds that Senator Bankhead "is at once recognized at his right," referring of course to the President's right. Almost all other participants are identified (including Mr. Derby), but the caption makes no reference to the four roosters caged in front of the assembled crowd. They are, indeed, the illustrious roosters donated by their famous owners to the cause of Good Roads. The "Rooster Bridge," as it was known, served traffic on the Dixie Overland Highway and U.S. 80 until 1980, when it was demolished and replaced by a bridge on new location. A second parallel bridge will soon be built at the new location. These figures, however, were on paper only. An article in The Demopolis Times stated, "In all the excitement, proper records of some of the purchasers and their bids were not made and a great deal of money was never paid. Even the bidder who won "Woodrow" neglected to pay for his rooster. In all, the effort raised only $45,000 for the bridge. As a result, construction was delayed until 1922. A 1971 resolution passed by the Alabama Legislature decreed that any bridge or bridges that cross the Tombigbee River at that point shall bear the name Rooster Bridge.